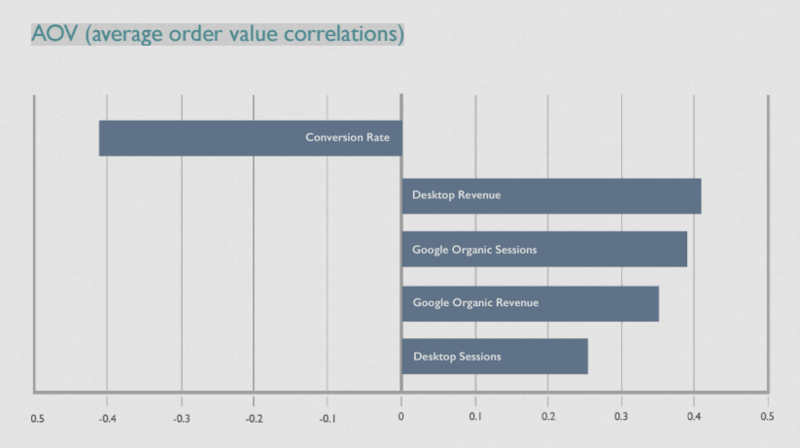 Which Digital Marketing Metrics Correlate with Conversion and Average Order Value? Want to ramp up your conversion rate? Keen to boost your average order value? 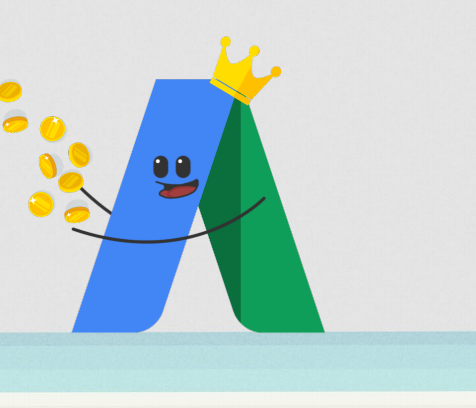 Worried your bounce rate is costing you customers? Or simply want to understand the relationships between the various metrics? In this excerpt from The Wolfgang E-Commerce Benchmarks 2016 Study, we’ve correlated all the metrics in the study with conversion rate and average order value (AOV). The websites who got more than the average proportion of traffic and/or revenue from AdWords enjoyed higher conversion rates. This was the strongest correlation found in the study. Websites who got more than average traffic and/or revenue from mobile devices enjoyed higher overall website conversion rates. Direct revenue is a healthy sign of repeat visitors and loyal customers which will boost conversion rate. We found significant correlations between websites with higher than average direct traffic proportion and higher conversion rate. There was a strong correlation between quicker server response times and higher conversion rates uncovered in our benchmark study. The correlation here was 3 times stronger than other engagement metrics such as pages viewed and time on site. This demonstrates the widespread 'all bounces are bad' notion is simply wrong. If Google is doing its job correctly, it delivers people to the webpage with the info they need, from where they happily bounce off. The websites who enjoyed more traffic than the study average enjoyed higher conversion rates and vice versa. If your conversion rate is lower than the study average it might be because your AOV is higher. 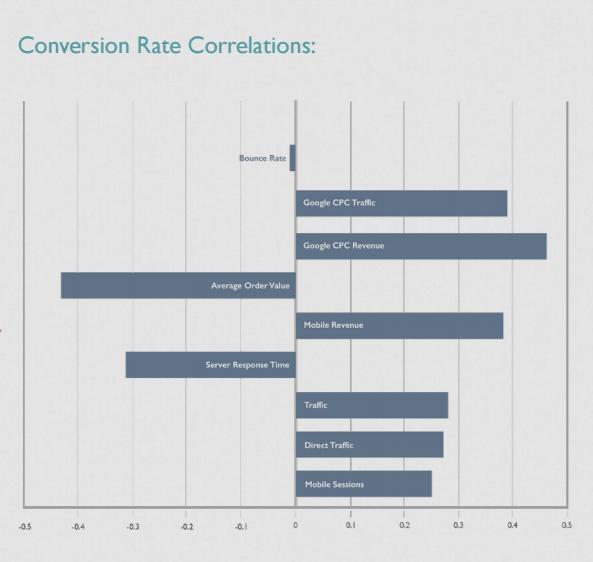 We found a solid negative correlation of conversion rate decreasing as AOV increases. There is a very strong correlation between desktop revenue and traffic with high AOVs. Those high AOV transactions tended to happen for websites who enjoy more than average organic traffic and revenue. Those websites with broad SEO coverage are being rewarded by the research-heavy, high-value customer.